Lugano is definitely one of my favorite places in the world. 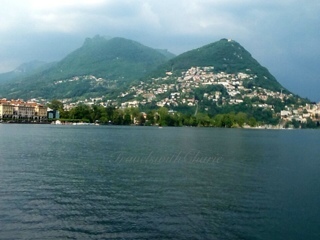 On my first visit to this lakeside beauty many moons ago, I walked everyday along the lake from Paradiso where I was staying to Piazza della Riforma to have lunch at one of the cafés or restaurants in the city center. On the way back to my hotel, I'd stop by the Church of Santa Maria degli Angioli on Piazza Luini to marvel at the 16th century fresco of the Crucifixion by Bernardino Luini, a follower of Leonardo da Vinci. In the same nondescript Church of Santa Maria is a painting of the Last Supper which is also attributed to Luini. Whether you're facing the altar or the main door of the Church, you are blessed with a visual treat, one man made, the other, by a divine hand. The Church door opens to Lake Lugano.